Unfortunately, intimate partner violence (IPV) is a sad reality for many throughout the state of Missouri and the United States. And many times, nurses are at the front lines of intervention. Throughout the Sinclair School of Nursing, faculty members are preparing student nurses to be attune to the signs of domestic violence and working to help victims. Throughout the U.S., it is estimated that 1 in 4 women and 1 in 7 men have been the victim of severe physical violence by an intimate partner. Outside of the harm in the immediate altercation, domestic violence can have long-standing effects on the victim’s physical and mental health. According to the CDC, women who experienced violence by an intimate partner in their lifetime were more likely to report having asthma, diabetes and irritable bowel syndrome. Both men and women who experience this kind of violence were more likely to report frequent headaches, chronic pain, difficulty with sleeping, activity limitations, poor physical health and poor mental health. Therefore, it is likely all health care providers will encounter intimate partner violence during their career. However, according to Dr. Lea Wood, director of the Sinclair School of Nursing Essig Simulation Center, most health care providers lack the training needed to feel confident and competent in screening patients for IPV. To combat this incompetency, Dr. Wood created the IPV Training Program implemented in the Essig Simulation Center. The IPV Training Program combines didactic and interactive learning. Students started the session by reviewing a presentation that discussed the prevalence, significance and epidemiology of IPV, the impact IPV has on the victim, health care provider and the health care industry, appropriate screening tools and interview techniques and general safely plan. reviewed an IPV resource card. Finally, students moved into the simulation center. Interacting with a standardized patient, the students had the opportunity to conduct an IPV screening interview, provide resources and collaborate with the patient to develop a safety plan. They then met as a group to debrief and discuss the effectiveness of different strategies they practiced. Overall, students are finding this training to be both useful and necessary. 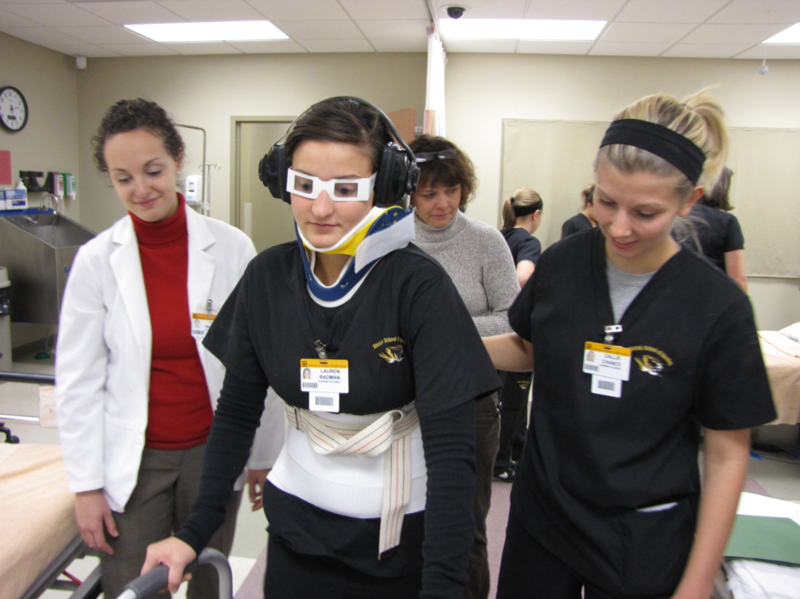 The simulation training is already a staple in the undergraduate track, but because of the success and necessity of the training, the program is expanding. It now includes two simulation scenarios. The first is screening for IPV after signs of physical abuse were evident, and the second includes a male victim of emotional abuse. The training has now been integrated into the Doctor of Nursing Practice program in addition to the traditional undergraduate track. Dr. Tina Bloom, who has spent much of her career dedicated to intimate partner violence work, believes health care providers should expand their knowledge of the issue. While preparing students to screen for IPV will help many in the future, Dr. Bloom is working on innovative but tangible ways now. coworker got a job as a full-time research nurse for Dr. Mary Ann Curry. As it turned out, Dr. Curry actually needed two research nurses for the project, and Dr. Bloom’s coworker recommended her for the job. Dr. Curry, who is an alumna of the Sinclair School of Nursing, was working on a large, randomized controlled trial of a nurse case management intervention for pregnant women who were abused by an intimate partner or at high risk for such abuse. Dr. Bloom also credits Dr. Curry for pushing her to take the next step in her career. intimate partner violence. Dr. Glass and Dr. Karen Eden developed a safety planning decision aid for abused women. “One of the critical issues in this field is safety planning with abused women, a dialogue where advocates and women identify her level of risk, her resources and her priorities and then make a plan for increasing her safety, which is quite effective to reduce violence exposure, but the vast majority of abused women don’t access services where they can receive safety planning,” Dr. Bloom says. Therefore, the team decided to put the program on a laptop. Dr. Bloom beta-tested it for the programmer and then took it around to domestic violence shelters for abused women to test the program. The abuse survivors who tested the program responded to it positively, had less conflict about their safety decisions after just one time using it and thought it would be very useful to have it online, where they could access it privately and over time. Since that initial study, Dr. Bloom has been part of the large, multidisciplinary, multi-site team Dr. Glass built to take this work further. The team adapted the safety planning decision aid for a web-based format in response to women’s feedback and conducted a large, NIH-funded randomized controlled trial of the intervention with 720 abused women, whom they followed for a year. Dr. Bloom developed new tailored components of the decision aid for pregnant or postpartum women. She was funded by the Robert Wood Johnson Foundation to test the feasibility and acceptability of the program with hard-to-reach pregnant women. Most recently, the team has adapted the decision aid for college women, who are the highest risk age group for an abusive relationship, and developed a component that can be used by a friend or family who is concerned about a loved one’s relationship. The team has also adapted the decision aid into a downloadable app for smartphone use, especially important in trying to reach college students. They are currently conducting a dissemination trial of the app with college students in order to learn which strategies are most effective to increase awareness of the app and to increase uptake and use of it. The program, called myPlan, will soon be available free for anyone to download as an app or use online. For Dr. Bloom personally, the work has been her life’s calling.